First bald eagle hatched on northern Channel Islands in 51 years ! In March biologists spotted a bald eagle nest with an egg, on Santa Cruz Island. On Wednesday, April 12, 2006, the egg hatched and the first bald eagle chick since 1949 chirpped to its parents on one of California’s northern Channel Islands. This is very exciting news not only for the bald eagle, but also for the island fox. Bald eagles and island foxes lived together amicably on the Channel Islands for thousands of years. 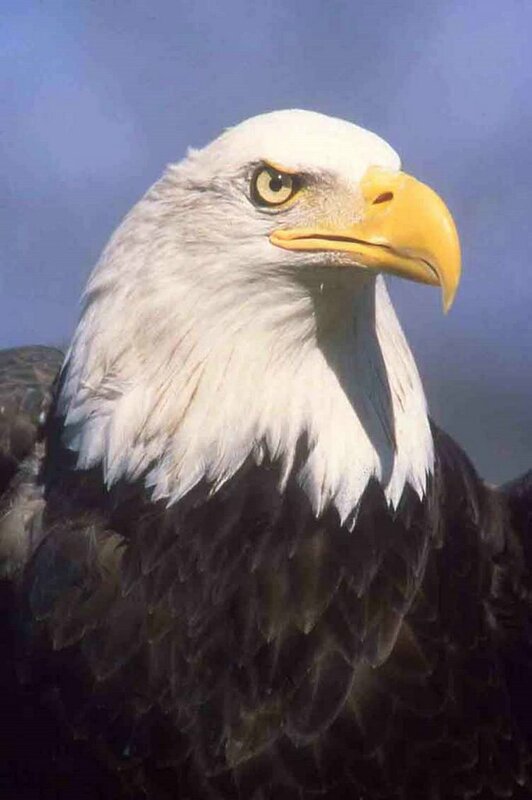 The bald eagle preyed primarily on fish, sea birds, and carrion, while the omnivorous fox hunted the islands’ small rodents, insects, and birds, and also foraged for a variety of native fruit. The two predators each had their own niche and played an important role in maintaining balance in the island ecosystem. The delicate balance, however, was destroyed when the chemical insecticide DDT (dichlorodiphenyltrichloroethane) entered the marine food chain. Small sea life absorbed the DDT, they were eaten by fish, who in turn were eaten by the bald eagles. High levels of DDT in the bald eagles caused them to lay eggs with thin shells that cracked when the parents tried to hatch them. The last successful bald eagle chick on the northern Channel Islands hatched on Anacapa in 1949. Without the territorial bald eagle, the islands were open habitat for the golden eagle. Golden eagles migrated to the islands to hunt the large number of feral pigs on Santa Cruz Island. Preying mainly on mammals, the golden eagle next began hunting the island fox. In the late 1990’s predation by golden eagles nearly pushed the island fox to extinction on San Miguel, Santa Rosa, and Santa Cruz Islands. In the last few years, over 40 golden eagles have been removed from the northern islands and relocated to the mainland. Since 2001, 46 young bald eagles have been returned to Santa Cruz Island. As the bald eagles have matured they have begun reclaiming the islands as their own. With the hatching of this first youngster in April 2006, there is hope bald eagles will once again be able to make the northern Channel Islands their home. A successful return of the bald eagle would be a important step toward restoring the natural balance and making the islands safe again for the island fox. Become a Fox Ambassador School!